As guitarist Scott Holiday explains, the key to creating a sound that has real impact in the studio is to make sure your drummer sounds great. And when it comes to hard rock, few percussionists sounded bigger or better than Led Zeppelin’s John Bonham. Much of this had to do with the way Bonzo played and tuned his kit, but another part of the equation was how he recorded his drums. Often referred to as the “Glyn Johns Technique,” this relatively easy method of mic placement was discovered “by accident” while British engineer Glyn Johns was recording Led Zeppelin’s debut album. It’s not necessary to know all the audio science of why it works — that’s best left to the engineers — but it’s damn good information to have in your back pocket so you can request it at your next session (if your engineer isn’t already using it). 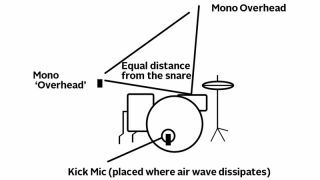 • Position the first overhead mic 40 to 60 inches from the center of the snare, facing downward to the kick drum pedal. • The second overhead will be positioned to the drummer’s right-hand side, with the mic’s diaphragm toward the high-hat, over the tops of the floor tom and snare drum (a simpler way to describe it is, the microphone will be positioned facing the drummer’s right side exactly 40 inches from the center of the snare). • After that, only two more mics are needed: one on the kick and one on the snare. The final step, however, is essential to making the technique work. Once you’ve recorded the track, the microphones must be panned properly. Pan your kick and snare mics to the center, and then take or overhead mics and pan the one above the snare halfway to the right, and pan the one near the floor tom to the far left. This gives a depth and stereo image to the kit. There are numerous debates online about what works best, but it’s generally agreed that the effect will work just fine with any decent, standard-issue studio microphone.